Yesterday evening, I went to pay my respects to the old Union Carbide Building. The tower glowed softly in the drizzle. Its polished steel pinstripes caught the passing taillights, and the skeleton of smoky steel merged with the advancing dusk. The logo above the reception desk changed long ago; now it was JPMorgan Chase employees who flowed down the twinned escalators from the raised lobby, out into the great river of Park Avenue. The skyscraper appeared gracious and vibrant, the incarnation of white-collar America. It did not look doomed, but it is. If the bank has its way—and who’s to stop it?—workers will soon take acetylene torches to the 700-foot, 57-year-old building at 270 Park Avenue, razing and then replacing it with a 1,200-foot-high hyper-headquarters ample enough for 15,000 people. Union Carbide will become the tallest structure ever demolished by peaceful means, grabbing that mournful title from the 1908 Singer Building, which came down in 1968. The de Blasio administration is cheering: last year’s East Midtown upzoning was intended to produce just such behemoths. The multibillion-dollar project will throw off about $40 million to improve streets and subway stations, and rack up thousands of construction and office jobs. It’s true that Park Avenue between 47th and 48th Street is as fine a spot for a supertall tower as any in Manhattan. Given that One Vanderbilt, now under construction, is heading for 1,400 feet, the next JPMorgan Chase tower seems positively stumpy. Unfortunately, a building stands in the way of this glorious future, and this one is special. 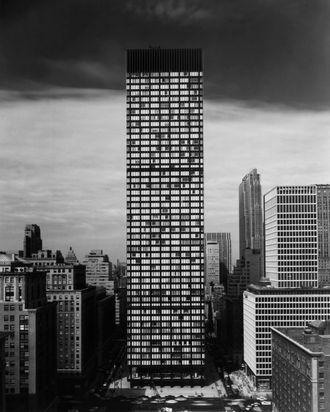 The tower at 270 Park Avenue was designed for Union Carbide largely by Natalie Griffin de Blois, a crack designer at Skidmore, Owings & Merrill’s New York office. As the rare woman in the testosterone-dominated world of midcentury architecture, she was (and remains) overshadowed by Gordon Bunshaft, the magus of modernist architects. Her career began inauspiciously. De Blois was working for a tiny but distinguished design firm in 1944, when she rebuffed a male colleague. The man complained to the boss, who resolved the intra-office sexual tension in the usual way: by firing her. “Well, I’ll call up Mr. Skidmore,” he told de Blois. “He’s downstairs — see if he needs anybody.” He did, and so did Bunshaft, who came to lean heavily on her talents. The Union Carbide Building deserves to continue existing, not because it was in the vanguard of a movement with a dubious urban legacy, but because it’s among the finest of its kind. The clear glass membrane, stainless steel fins, and slender bones combine to give it a texture and personality that so many imitators lack. It achieves regularity without monotony, the rhythm of its façade marked by syncopations: the low street level and double-height lobby above, the two bands of blackness that segment the tower and frame the illuminated grid of offices. While at the Seagram Building a few blocks away, Mies bordered the façade in bronze I-beams, here de Blois has the columns stand back from the corners so that the walls seem to meet in the lightest of pencil lines. Some of its details are already history. A crude corral has turned the once-public plaza into a permanent dead zone. The lobby’s glowing ceiling, a seamless machine that integrated light and ventilation behind a translucent scrim, vanished along the way. But to a great extent, the building has remained the creature it always was, an interplay of muscle and light, dark steel and insubstantial glass. None of this seems to matter if there’s enough money at stake. With employees spread from downtown Brooklyn to Jersey City, JPMorgan Chase has spent years hunting for ways around the building’s limitations. A decade ago, it gutted 270 Park in stages, making the effort (and spending the money) to earn the highest sustainability rating, LEED Platinum, in 2012. By 2014, the company was toying with a move to Hudson Yards, and presented the city with $1 billion laundry list of tax breaks and other incentives it wanted to sweeten the deal. The de Blasio administration balked, the deal fizzled, and JPMorgan Chase stayed put. Two years later, the administration was pushing a major overhaul of the zoning around Grand Central Terminal, which would allow bulkier towers and create a fund for street and subway improvements. Preservationists worried that the rush to build bigger would threaten the area’s architectural treasury. Several groups sent the Landmarks and Preservation Commission a list of vulnerable buildings; eager to clear the way for the mayor’s rezoning plan, the LPC made a dozen new designations, all but one from before World War II. Union Carbide didn’t make the cut. There may be a glimmer of hope. The LPC never decided not to designate 270 Park Avenue, leaving open the possibility that it might one day take action. So far, though, the nominally independent agency is behaving like a compliant instrument, its mission to safeguard history tempered by political pressures. The progressive mayor of New York wanted a mega financial institution to anchor his preferred business district, and no preservationist fussbudgets were going to get in the way.